Do you love home takeout? I do! I love takeout in general, but sometimes we don’t want to spend the money on eating out so I turn to my home-takeout method. 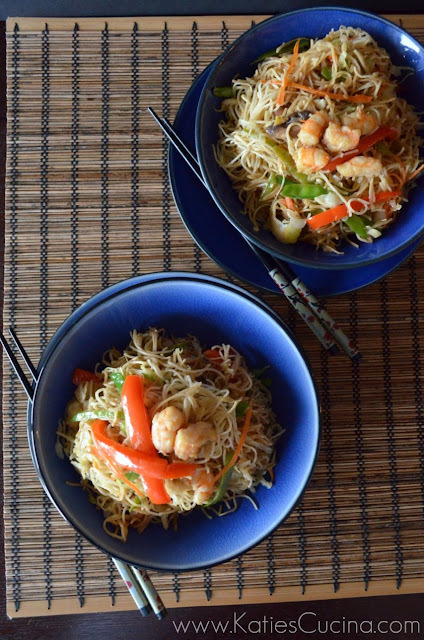 About two months ago I stumbled across a recipe for Shrimp and Veggie Lo Mein. 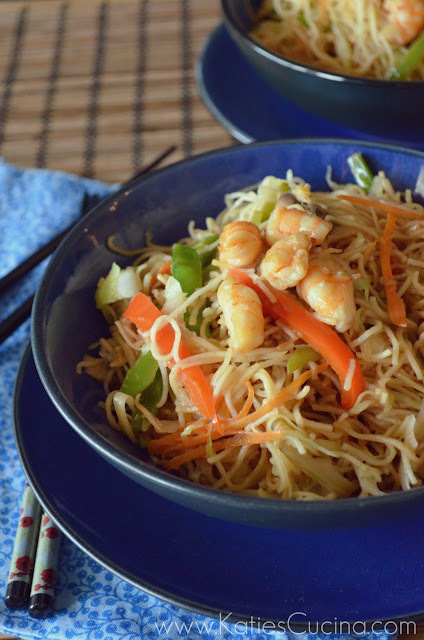 Ironically, although I’m not a big fan of lo mein at the local takeout joints I am head over heals for this Shrimp and Veggie Lo Mein I make at home. So much so that I have made this over a handful of times over the past two months! I would like to thank my mom for my love of Chinese food. Growing up I would beg for Chinese food for breakfast; back then I would eat chicken and broccoli with white rice. If my mom would have allowed it I would have consumed it for breakfast, lunch, and dinner, and then repeated the same meals over and over again until my little heart was content. Chinese food brings me comfort and I think that might be why I find myself yearning for it when I’m sick. Of course I love homemade chicken noodle soup, but the next best thing in my book is wonton soup and vegetable fried rice. I also love to make my Asian chicken and rice soup, too when I’m sick or on a cold winters day. 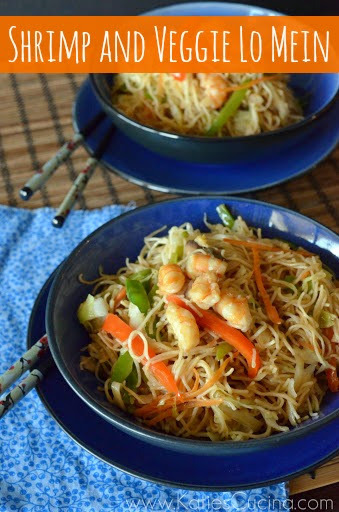 But since winter has long escaped from sunny Florida I’ll take this Shrimp and Veggie Lo Mein. It’s comforting, light, and best of all you can add as many vegetables and proteins to this simplistic Asian dish. Add the noodles to the boiling water and cook according to package directions. Add the cabbage, bell pepper, mushrooms, snow peas and carrot; cook for 30 seconds. Drain the noodles and vegetables thoroughly and set to the side. In a large skillet, heat the vegetable oil over medium for 1 minute. Then, add the onion, garlic and ginger. Cook, stirring occasionally, until softened and lightly browned, about 5 minutes. Then add the soy sauce, sherry and sesame oil; bring the mixture to a bubble for a few seconds. Add the raw shrimp and cook for 3 minutes. Then add the noodles and vegetables; toss well. Cook, stirring often, until the mushrooms are fully cooked and the peppers are tender but still slightly crunchy, about 3 minutes. I could eat this every night!! So great meeting you finally!! I am a HUGE fan of Lo Mein anything so this would be right up my alley. Well Meagan, I think you need to give this recipe a try then! YUM! This looks so good!! Pinning so I can give this a try soon!! Thanks Brandy! I don’t but I LOVE this recipe! lol. hey! this looks yummy but i don’t really like peppers, what would you replace the peppers with? thanks! Just omit the peppers–it will be ok without it. Pingback: 20 Chinese Recipes That Will Make You Forget Take Out Exists - My Life, Blogged.